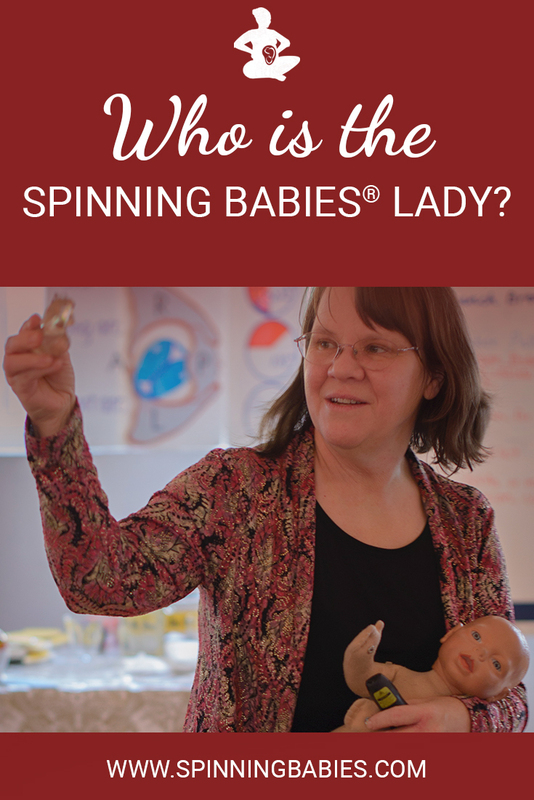 Gail Tully is the midwife from Minneapolis, Minnesota, USA who conceived and developed Spinning Babies®. Spinning Babies went online in 2001. “Shoulder Dystocia; The basics” Midwifery Today (Summer 2003). Her unpublished paper, Perspectives in Breech Birth (1994) helped to preserve breech options in Minnesota Traditional Midwifery law (1999). Thank you for the work you do for all these decades and still present with the vibe of humbleness to the process of birth as presented in a million ways. Whether you’re in pregnancy or in labor, start with Start! Start with balance and the rest usually works itself out. If you email, please note: By emailing Gail, you are agreeing that the content of your email may be used publicly on her site or social media. Names will not be posted unless you grant permission in your email. Concise stories telling how using Spinning Babies resolved a stuck or long labor, or helped achieve an “easier” labor are needed to inspire thousands of expectant women and couples. Sharing your story, even while you’re pregnant and the story is in progress, is a way to have a nice conversation. Gail does want to celebrate your journey and shares your desire for an emotionally nurturing birth. Do share your stories that tell how using these techniques resolved helped achieve an “easier” labor. And if these techniques didn’t work, share which ones they were and how frequent you did them and at what gestational age. That’s helpful, too! Like Spinning Babies on Facebook! Born in 1959, the third child in a splitting family, Gail found peace in nature and drawing. Gail’s mother, Jeanne Norman Tully, at first thought her third child had an extra chromosome. Later, Jeanne wanted Gail to become an artist, but Gail foolishly misjudged art’s ability to change the world and passed on an art scholarship to the Minneapolis Art Institute. Her first child was born in 1977 and Gail went into the College of Social Work at the University of Minnesota for a BS in Family Dynamics. It was a long, gradual college track. By the time she graduated, she was offering homebirth midwifery services and had her second baby. Her interests, if not development, in art and in the therapeutic process became folded into her prenatal preparations for parents. It wasn’t until the year 2000 that Gail finally got her Certified Professional Midwife certificate from North American Registry of Midwives. By that time, she’d started doula trainings (1998) and supporting nonprofits like the American Indian Center and United Way with their own doula programs. She got to lead 8 doulas through a pilot project conducted by Allina Health and saw the reduction of the cesarean rates by the doulas down to 3.9 percent. She got the Hennipen County Medical Center’s doula program up and running (8% cesarean rate with doulas) after a hospital employee showed the value of doula care. 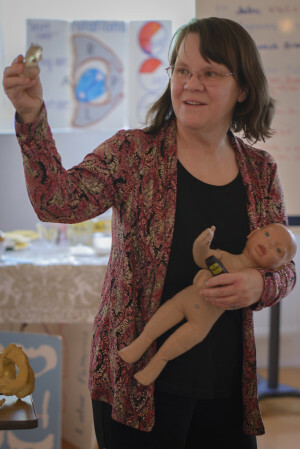 Gail continued supporting homebirth parents and finished her active midwifery after serving with Clare Welter, CNM, and Emme Corbeil, CPM, of Trillium Midwives during their start-up years. Gail took small but direct action in the grassroots efforts to regulate homebirth midwives. She wasn’t keen on regulation but saw the future and was instrumental in writing the description of normal birth for the law, pushing to make sure non-licensed midwives were not illegal in her state so that parents could pick who they wanted with them to give birth, and to keep the care of breech and twins within the definition of normal midwifery. She has then sought training in 7 countries by over 12 experts in breech to become proficient in solving breech obstruction during what would otherwise be a normal, healthy and supported vaginal breech birth. Breech Birth; Quick Guide complements Gail’s in person class for providers. Gail is also interested in how head down babies occasionally may get stuck shoulders. She found the literature and suggested (mandatory) solutions for this emergency to be lacking. Her development of FlipFLOP memory tool helps midwives and doctors remember an effective solution for over 80% of stuck shoulders and has another suggested solution for the others. Speed, success, and gentleness are dependent on where in the pelvis the shoulder waits. Resolving Shoulder Dystocia is Gail’s video class. Gail welcomes those that support physiological birth and the questions that will get us there.